MMP (Mushroom Model Publications) is based in the U.K. All their books are printed in English by their associate Stratus in Sandomeirz Poland. This new set of scale drawings was sent to me by Casemate Publishers in Pennsylvania in a heavily padded envelope to protect it and 4 other items. The cover art shows the cover of the book that is about these aircraft that MMP also markets. This is shown against a dark green background with yellow line drawings of what may be a Spitfire or other fighter. Strange choice. Inside the set are 12 large sheets that are folded in the center to create 24 pages in 8 ½” x 11” . Page 5 – 6 have a 1/72nd scale line-drawings as a side profile of a PZL.43/1 and a PZL.43A spread across them. Page 7 – 8 have a 1/72nd scale line-drawing as a 4-view of a PZL.46 “Sum” spread across them. Page 9 – 10 have a 1/48th scale line-drawing of a 3-view of a PZL.23A spread across them. Page 11 – 12 have a 1/48th scale line-drawing as a 2-view of a PZL.23B (side and top views) spread across them. Page 13 – 14 have a 1/48th scale line-drawing as a 2-view of the PZL.23B’s bottom and head-on views spread across them. Page 15 – 16 have a 1/48th scale line-drawing as a 3-view of a PZL.42 spread across them. Page 17 – 18 have a 1/32nd scale line-drawing as a 2-view of a PZL.43A (side and top ) spread across them. Page 21 – 22 have a 1/32nd scale line-drawing as a 2-view of the PZL.46 “Sum” (top and side) spread across them. 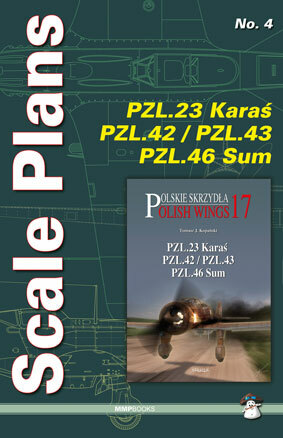 Page 23 – 24 have a 1/32nd scale line-drawing as a 2-view of the PZL.46’s bottom and head-on spread across them. All these line drawings are by Dariusz Komas, who did the line drawings in other sets of these scale drawings marketed by MMP. This set will be of significant value to modelers who have kits of these aircraft and to general aircraft historians also. The pages can be easily removed to be spread out on a work bench. I want to thank Roger Wallsgrove Editor-in-Chief of MMP and the folks at Casemate that sent me this review set. The Australian distributor is Platypus publications.